KOSCIUSKO — A Syracuse woman was arrested after battering a police officer while intoxicated. 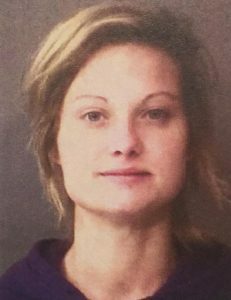 Sydney Ann Miller, 27, 500 N. Lake St., Syracuse, is being charged with battery to a public safety official, a level 6 felony; and disorderly conduct, a class B misdemeanor. On Feb. 2, officers with the Kosciusko County Sheriff’s Office responded to a report of an unwanted, intoxicated subject at a residence. Upon arrival, officers spoke with a male subject at the residence. The subject advised that a female, identified as Miller, was intoxicated and destroying things inside the residence and that he wanted her removed. According to the affidavit of probable cause, officers approached Miller and attempted to speak with her about finding a place to take her because she was no longer welcome at the residence. Officers could smell the strong odor of an alcoholic beverage coming from Miller’s person. While attempting to contact Miller’s family members to find a location to transport her to, Miller jumped off of a countertop and fell face first into a doorframe, causing her to sustain an injury to her nose and facial area. While transporting her to Kosciusko Community Hospital due to her injuries, Miller attempted to kick an officer in the face. She then struck the officer’s arms and hands, attempting to bite the officer on two occasions. Miller then kicked the officer in the stomach. While strapped to a hospital bed, Miller screamed after being told to stop multiple times by officers. This caused a disruption in the hospital’s emergency room. Miller has already been arrested and released on a $5,250 surety and cash bond. She has an initial hearing date set at 8:15 a.m. Thursday, Feb. 21, in Kosciusko Superior One Court.